The outside cover of the Advanced Elements Lagoon 2 inflatable kayak is made with two different materials; the topside is a high denier Polyester with a PVC laminate, while the bottom (Hull) is made with a PVC tarpaulin. "PVC tarpaulin" is made by combining two sheets of PVC with a fabric mesh in the middle. In addition the inner tube is covered with a high density fabric to increase performance and durability. Its bow and stern have fixed rigid forms that help cut through the waves and keep you on course. The Lagoon has a inner tube cover for increased rigidity and durability. It has molded rubber-grip handles, bungee deck lacing, padded seat rests, mesh accessory pocket, tracking skeg and foam floor. The Lagoon replaces the Dragonfly for 2009 with stronger, more durable tube covers. We own a hard shell kayak but found it to be a real nuisance to take it on long trips on the car. This kayak has been a great pleasure to use. It is easy to set-up and comfortable to sit-in. We are casual paddlers, so I can not speak for those who are paddling enthusiasts. We love this kayak. It is unbelievably easy to inflate and performed great in the water. We'll be buying a second so the whole family of 4 can kayak at the same time. I saw other reviews that recommended the pump with a guage, but I don't think it's necessary. It's pretty easy to tell when the kayak has enough air. I would recommend getting a pfd that fits well--otherwise, if the pfd ends at about the same level as the seat back, it's a bit uncomfortable. I experienced that when I kayaked with my husband, when I sat in front for the first time. The other times I was in the back and one of my kids was in the front, and I had no problem. The backseat space is a little roomier than the front. Overall, a great lake/bay kayak for those without the ability to store one year-round. I was so excited to receive my kayak that I inflated it and put it in my pool. I have taken it out every weekend since I received and and just love it. Great quality. I love the portability and ease of use. We LOVE this kayak. We've used it for family lake recreation and it has been terrific. I like it better than our hardside kayak. Great product at a great price! I got it for $80 less than what REI was charging; it arrived really quickly (around 4 days) and was really easy to set up. I have only taken it out once so far - I'm in a teaching program so I don't have too much time - but I live in Chicago and plan on making a lot of river day trips later this summer. I was really happy with this kayak, I've had only moderate boating experience and this is my first kayak so if you're a beginnish than check this out. We have had this kayak for over a year now. It is practical for storage and transport. Takes no time at all to put together and the cushioned seats are comfortable. If you are looking for an easy convenient way to get on the water and get some exercise as you ride around the lake or a river, this kayak is a good bet. Easy to assemble and carry with two people. I bought the package deal and shipping was great and complete. It was a smart purchase for us and unless you intend on shooting rapids, it is a great buy. Very pleased with this kayak, and with purchasing from Austin Canoe & Kayak. Shipping was very fast after ordering on a Sunday! Along with the kayak, I purchased the Advanced Elements Bellows Foot Pump and two Bending Branches Whisper Dream Kayak Paddles. The Advanced Elements Bellows Foot Pump includes several connector tips that are conveniently attached to the pump hose. 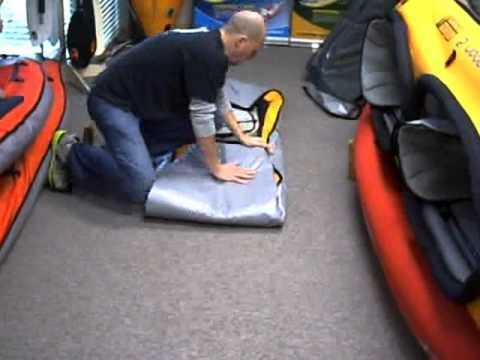 Two of those connectors connect perfectly to the two types of inflation spots on the kayak and its inflatable seats (unlike the problem mentioned in a prior review). Without straining, am able to have the kayak and seats fully inflated and ready to go in about 10 minutes. Have never needed to use the "deflate" capability of the foot pump, but it is there. Decided to get the Bending Branches Whisper Dream Kayak Paddles even though they only disassemble into two pieces instead of the other paddle which disassembles into 4 smaller pieces. The Whisper Dream paddles specs showed that they had a larger paddle surface, and I did not really need the small disassembled size of the other paddles. Got the 230 CM size and that has been fine for my partner and I who are about 5'5" to 5'8" tall. Have used the kayak 5 times so far and it has performed satisfactorily each time. - Twice on the Hudson River, once in windy, raining conditions and once with the tide against us part way. - Once on a lake with a fair amount of choppy waves due to motor boats. - Once in a calm, open, sound- like body of water. - Once in a long creek The kayak feels stable when sitting it. My kayaking partner, who is not a great swimmer, is comfortable in it. Our combined weight is about 290 pounds, so it is within the stated limit of 350 pounds. The inflatable seats are very comfortable and provide good back support. Another plus is that this inflatable kayak not only performs satisfactorily, it also looks like a real kayak, not a pool toy. There is good space in the seating areas of the kayak for legs and feet, plus perhaps a soft-sided cooler and some gear. I have always brought the foot pump with us but have never needed it. Plus there is the front tie-down. However, this is not a kayak to go camping in. The 37 pound folded weight is ok and so is the packed size. No trouble getting it back into the bag. If any of the Advanced Elements designers are listening, the only suggestion would be to make the rear "fin" detachable and perhaps slightly larger. Then fin tends to stay bent to one side as a result of packing. If it were detachable, it would not bend to one side and probably could be larger. Summary: I would purchase this kayak again, and would purchase it from Austin Kayak. It is great to be able to go kayaking without having to deal with the hassle of a kayak on the roof. I was very pleased with the kayak. The shipping was faster than expected and I was able to get into the water a couple of days earlier than expected. It is very easy to inflate and deflate and handles in the water very well. Even putting it back into its "suitcase", provided, was simple. The only drawback is that it does not come with a pump and it was somewhat difficult to find one that worked well. I am very pleased and love this kayak. It is quick and easy to inflate. We had a blast on the water. As a novice kayaker, I was able to maneuver it with ease and was quite comfortable in it. Deflating and packing it up is just as easy. I am looking foward to many more fun days on the water! I purchased the Lagoon 2 package and definitely recommend this kayak package deal. The purchase experience from ACK was great. The items were sent promptly and UPS delivery was right on time. Easy to inflate. Plenty of room. Glides easily across the water. Q: Can this kayak be used in salt water? A: Yes, this kayak can be used in salt water. It is always best to just rinse it off after each use. Q: do you still stock the Advanced Elements Lagoon 2? Do you have the drop stitch floor? what's the cost? thanks ..
A: Yes, we still carry this kayak. We don't regularly carry the dropstitched floor, but we can special order that item for $229.99.